Welcome to this history of the Asiatic Pheasants transfer printed china pattern, which was made by many British potters and by 1880 had achieved universal popularity. Asiatic Pheasants, also known as Asiatic Pheasant, is a quintessential English design inspired by an oriental original. You have arrived at the recognised point of enquiry for everything and anything about Asiatic Pheasants. With your help and information the available data will grow, remaining questions will be answered and the usefulness of this site will increase. This is an information site and if you wish to buy Asiatic Pheasants china please visit the website of our sponsors Lovers of Blue & White where you will find Asiatic Pheasants in all shapes, sizes and ages. Use any of the links on the left Catalogues: China for sale. This site was created by the late Stewart Hudson. His foresight and your contributions to the makers' backstamps and the backstamp illustrations database have enabled this site to grow in its usefulness. If you can help with either photographs or information we have compiled a "wish" list on a separate page. We receive many requests to identify makers of Asiatic Pheasants and if you send photographs we will do our best to do so. However, we are unable to offer valuations. 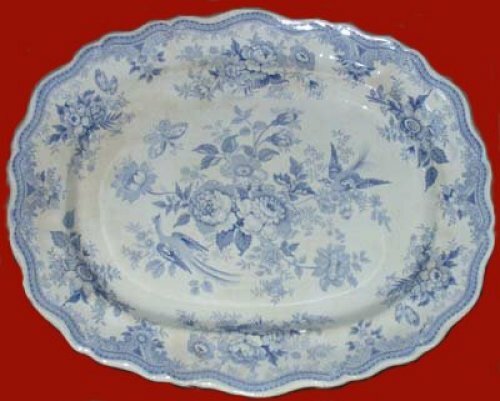 Lovers of Blue & White offer a wide selection of 19th Century transferware and 20th Century English transfer ware with many different designs and colours.